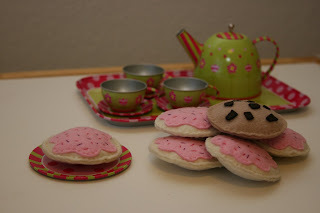 One of my favorite Christmas gifts to give this Christmas was a tin tea set with homemade felt cookies for my daughter. I saw some adorable sets on etsy, but decided to make some cookies myself and went on a hunt for a cute tin tea set. Here is what she received this year. Isn't it cute? 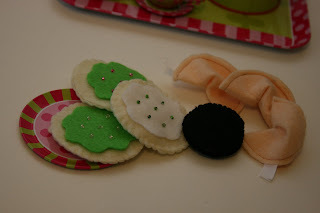 I found the tin tea set at a local kids toy store and then began the simple process of making felt cookies. I made sugar cookies and chocolate chip cookies. They were so fun to make and I made quite a few extra that we'll use for gifts at upcoming birthday parties this year. I just used the cheap felt that you can buy at any craft store (comes in tons of colors) and traced a lid to a jar for my cookies. I didn't take pictures of the process but I'm sure you can imagine how easy this was and I bet a google search will turn up lots of results if you need help. I didn't use a pattern for my icing layer...just cut until it looked good...and then stitched sprinkles on it. I made a few with beads first and then decided to go with the embroidery floss for the sprinkles until my daughter is a little older and won't try pulling them off. Then I just stitched the icing layer to the top circle and then stitched the two circles together and added a little batting to them before I stitched them closed. 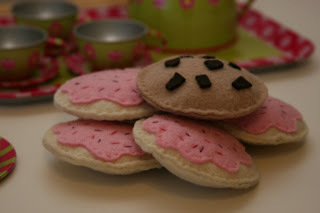 If you do a search on etsy or google for felt food, you'll find a ton of ideas. My sisters in law made these sweet cookies for Breanna. There are sugar cookies, an adorable Oreo with cream filling (I should have taken a better picture of it so you could see the filling!) and the cute fortune cookies! I love them and what's even better is that my daughter will be playing with these for years to come. I love that they're hand made and the possibilities are endless. Have you made any felt food? 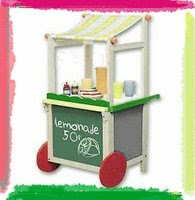 I think they're all adorable and can't wait to make some more pieces for my kids play kitchen.